Dressing baby for their first Halloween can be made simple with these adorable baby one-piece bodysuits. 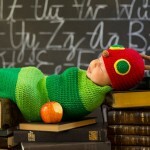 Baby can stay cozy and comfortable, while still taking part in the Halloween fun. These little bodysuits make for fun Halloween photos and memories. 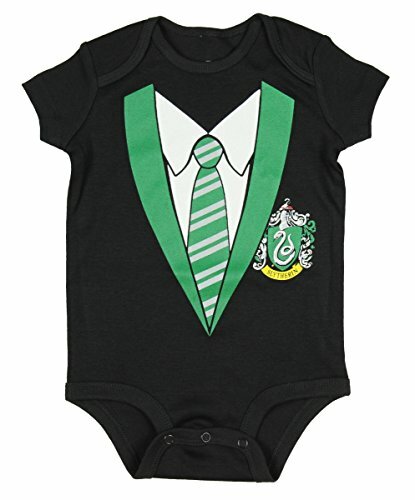 This baby romper comes in sizes ranging from 0 to 6 months, through 18 to 24 months. 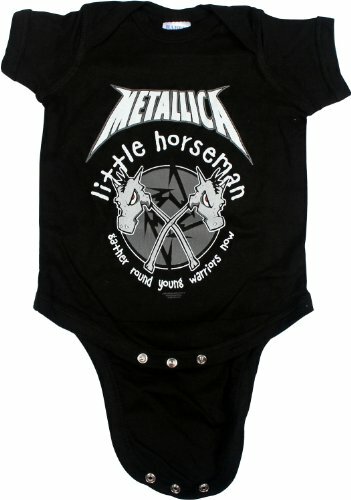 Black one-piece bodysuit is black and says “Metallica: Little Horseman gather round young warriors now,” and features a circular logo with two stick horses. Easy snapped closures for hassle free diaper changes. 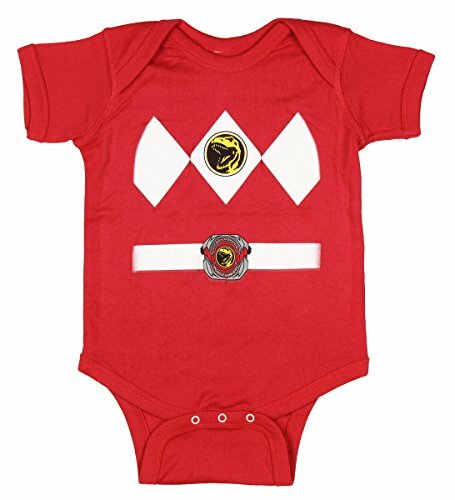 Your little one will be ready to rock this Halloween in this bodysuit. 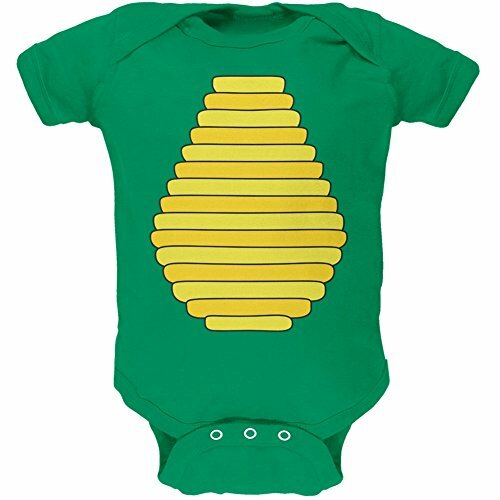 This 100% cotton one piece bodysuit comes in sizes 6 months and 12 months. Detailed graphic design features a front that looks like a zip up jean vest over a black printed tee with one red and one green shoulder, with a large pocket watch dangling from around the neck. Bottom is blue with a number 8 in black within a white circle. 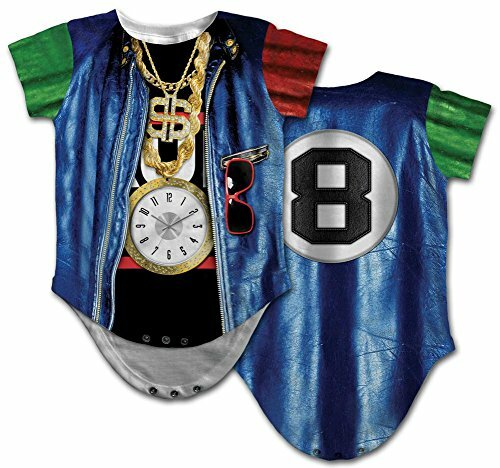 Baby will be a rap master with their own bling this Halloween. Available in sizes 3, 6, 12, 18, and 24 months, this 100% cotton one piece has a snap closure for easy diaper changes. 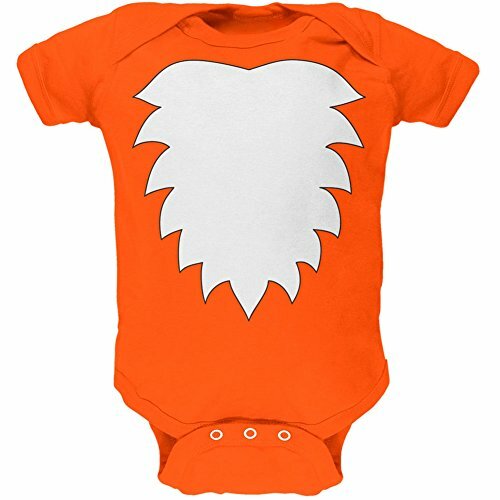 Solid orange color with white fox fur design on the chest and a matching tail graphic on the back side of the bodysuit. Your baby will be the cutest little fox on Halloween! This is a 100% cotton one piece with snap closures, available in sizes 3, 6, 12, 18, and 24 months. 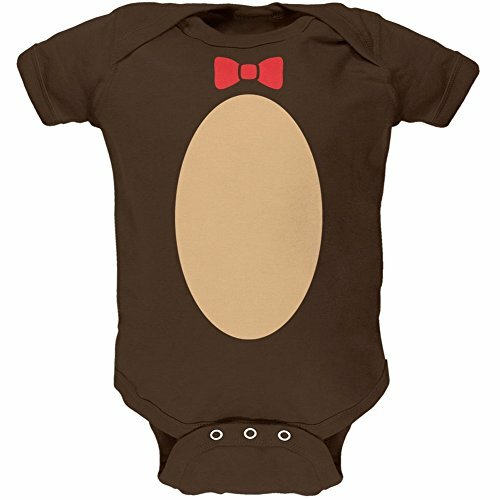 Bodysuit is a solid brown color with a tan colored belly and a pink bow tie. Baby will be a cuddly Halloween teddy bear that everyone will love this year. This 100% cotton one piece features snap closures and comes in sizes 3, 6, 12, 18 and 24 months. Black one piece features a skunk fur graphic on the front and a tail graphic on the back. Your baby will be the cutest little stinker this Halloween in this cute skunk bodysuit costume. 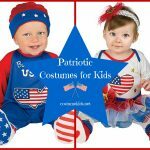 This is an adorable cartoon dragon costume made from 100% cotton with snap closures for easy changing. Features a green bodysuit with yellow or black with purple dragon printed “dragon” graphics on both front and back. Super cute for baby’s first Halloween. This bodysuit comes in sizes 12 to 18 months and 18 to 24 months. White short sleeved bodysuit is trimmed in red around the sleeves, neck, and leg opening. Snap closure for easy diaper changes. Features the Red Hot Chili Peppers red asterisk logo and the band name Red Hot Chili Peppers in black. Available in sizes 0 to 6 months and 6 to 12 months, this 100% polyester costume includes the printed jumper, hat, and matching booties. Printed details include a belt, tie, and handcuffs. Blue hat says “police”. Makes a super cute costume for baby’s first Halloween. 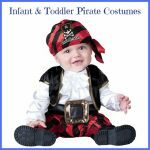 Available in newborn size 0 to 6 months and infants size 6 to 12 months, this 100% polyester costume that includes printed jumpsuit and matching hat. Blue jumper is printed with the Superman “S” logo in red and yellow, and red hat has the same logo. 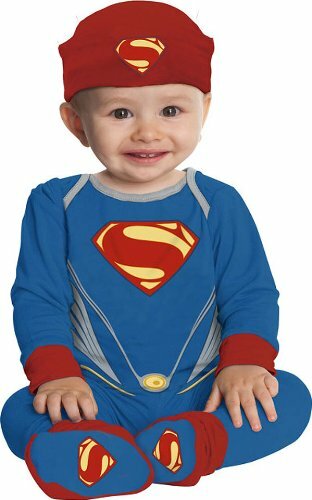 Baby will look super cute as the man of steel this Halloween. 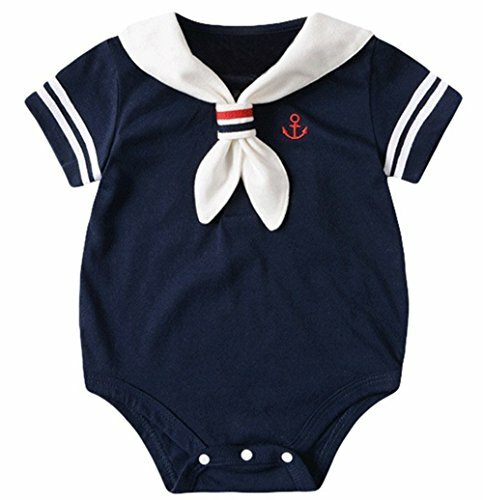 This outfit comes in a size ranging from 0 to 6 months through 18 to 24 months. Includes a cotton blend jumpsuit and matching hat. 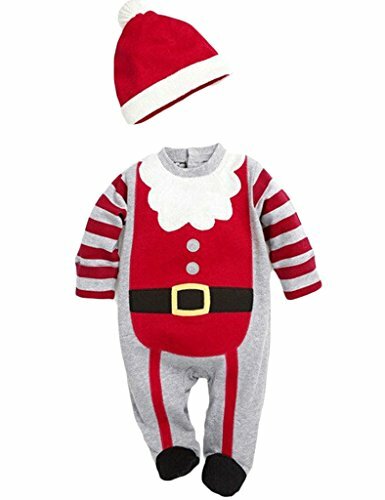 Jumper has red and gray striped sleeves, black belt, red middle and white Santa beard. Hat is red with white trim and pom pom. Great look for Halloween or Christmas. This outfit comes in various size ranging from newborn to 24 months (see size chart). 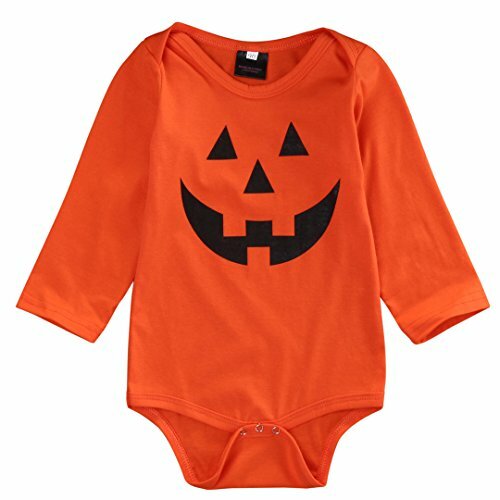 Long sleeved orange bodysuit is made from 95% cotton and has snap closures. Printed with black Jack-o-Lantern face details. Makes the perfect first Halloween costume for baby. This brown one piece bodysuit is made from 100% ringspun combed interlock cotton and has three metal button snap closures for easy diaper changing. Printed with image of football stitching in high quality stretchable vinyl. Transfer will not fade, crack, or peel. 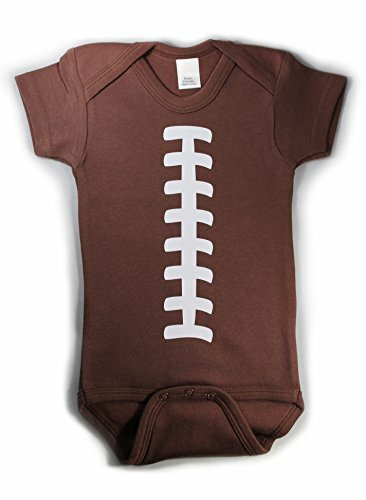 Your bouncing baby football will look adorable this Halloween in this costume. Available in sizes 12 months and 18 months, this 100% cotton snapsuit has snap closures for easy changing. Black one piece features the colors and symbol of each of the Hogwarts houses, with a printed white shirt and tie in those colors. Choose from Gryffindor, Slytherin, Huffelpuff, or Ravenclaw. Available in sizes newborn to 18 months, this 100% soft cotton one piece is white with long sleeves and snap closures. 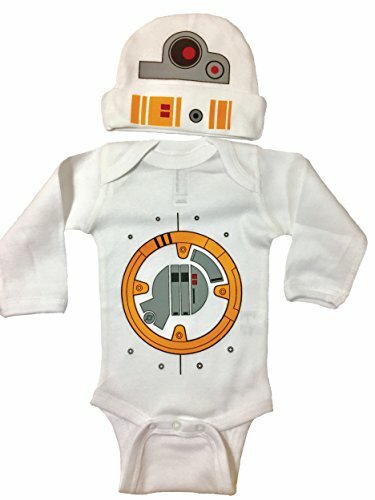 Printed with orange and gray details of the BB8 character from Star Wars on both bodysuit and matching white hat. Super cute costume for the tiniest Star Wars fan. 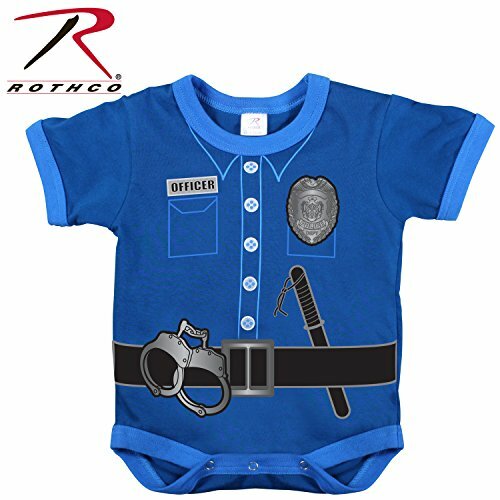 Made from 100% cotton with bottom snap closure, this one piece has a printed police uniform design featuring a badge, belt, and handcuffs. Short sleeves and navy blue in color. 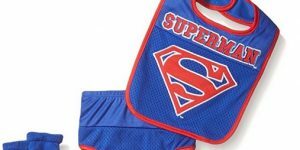 Comes in sizes ranging from 3 to 6 months to 2T. This is an adorable one piece 100% cotton bodysuit that snaps at the leg closures. 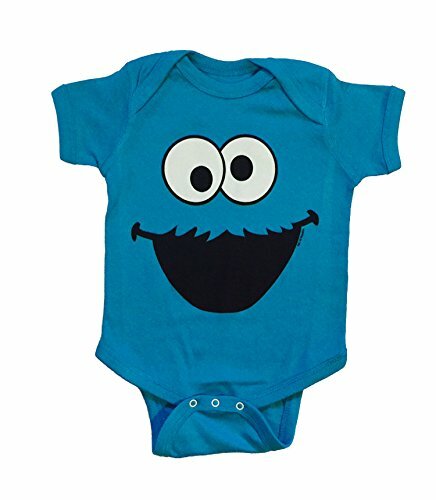 Bright blue color with the eyes and mouth of the Sesame Street character Cookie Monster are printed on the front. Comes is a size 6 to 12 months. Available in size ranging from 0 to 3 months to 12 to 18 months. Features snap closure bottom, lap shoulder neckline for easy dressing, and double stitches hems for added strength. Made from 100% interlock cotton fabric. Girls version is black with white pearls and purse print, while boys is black with a tuxedo print on front. 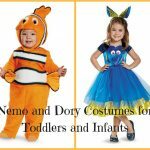 Cute baby look for Halloween or a special occasion. 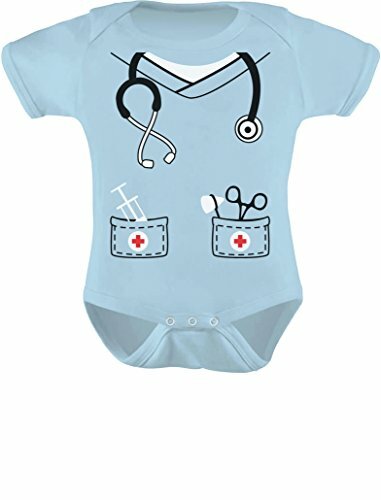 Available in sizes newborn through 24 months, this one piece bodysuit is printed with graphics for either a doctor or nurse, including a stethoscope, shot, and scissors. 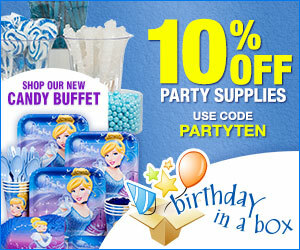 Available in colors aqua, gray, dark gray, green, pink, navy, red, and wow pink. 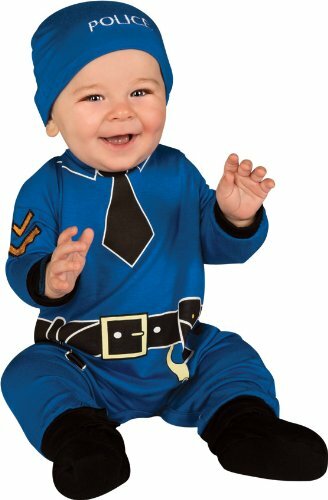 Makes a cute first Halloween costume for baby. Available in sizes from newborn to 12 months. 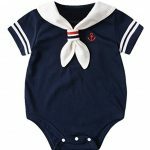 This cotton blend one piece is offered in either black or white and has a cute sailor design and embroidered red anchor. Made from a cotton blend fabric. 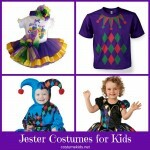 Perfect for Halloween, special occasions, or photographs. 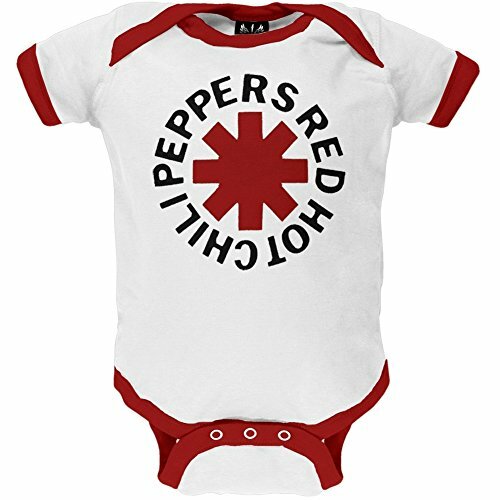 Comes in sizes newborn to 18 months. Black color is made from 199% cotton, while heather color is 90% cotton and 10% polyester. Short sleeved with bottom snap closures. Printed with tuxedo details in white, green, and pink. Pin this image to Save these Ideas for Later!